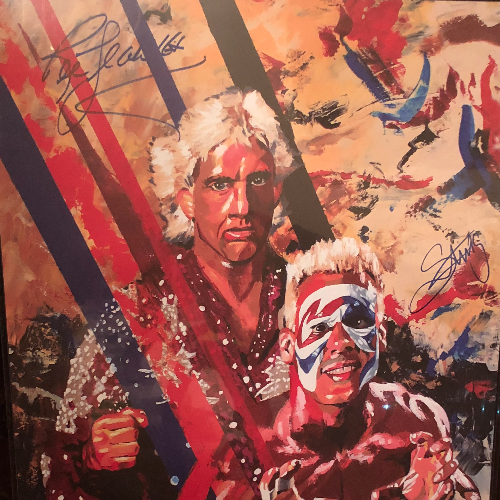 Cen-Cal Pro Wrestling is raffling off a limited edition lithograph of wrestling icons Sting and Ric Flair, signed by the legends themselves. This lithograph is laminated and framed, and includes a certificate of authenticity, guaranteed by Highspots.com, including photos of Sting and Flair signing the item. Tickets to enter this raffle cost $10 each, or 3 tickets for $25. ONLY 100 TICKETS WILL BE SOLD! Tickets bought online will be mailed to you upon purchase. Tickets can also be purchased at any Cen-Cal Pro Wrestling or Planet Lucha show while supplies last. The raffle will take place on January 1st, 2019 or at the Cen-Cal Pro or Planet Lucha show immediately following the sale of the 100th ticket, whichever comes first; and will be broadcast live on Cen-Cal Pro's Facebook page. The winner need not be present, as we will have your contact information to inform you that you have won.